This was published in Frieze Magazine. The photographs of the works that I’m putting up over here are mine. They’re all details of the works, which you can see in their entirety if you click on the link above or head over to the website for Amrita Jhaveri Projects. 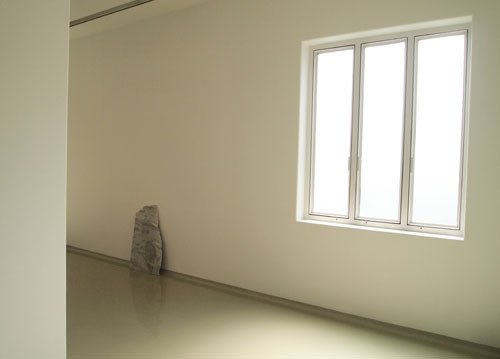 A wide, white wall confronted visitors to Gyan Panchal’s exhibition at Amrita Jhaveri Projects. On its pristine surface were two pieces of granite – one slender and grey, the other curved, and the colour of dried blood (prai, all works 2012). Panchal chose Proto-Indo-European words as titles for his work, but was adamant no translations be offered. He wanted viewers to appreciate and respond to the sculptural installations without the help of context or associations. However, if you look up your handy Proto-Indo-European dictionary, you’ll discover that ‘prai’ translates as ‘before’, and Mrmrajo – sheets of sea-green recycled plastic that were pinned to the wall and fluttered delicately – as ‘murmur’. Other titles in the show included cicami (go away), and wedhneumi (link or relation). Panchal, who has Franco-Indian parentage, chose words from a language that is the root of the two linguistic traditions (Latin-derived French and Sanskrit-derived Gujarati) that he inherited. What emerged from his titles is a sense of shifting distances, as though one had to come close and then step away from the material and the work to truly see it. Paris-based sculptor Panchal’s first solo show in India was created from objects he chanced upon in Mumbai. In the past, he has transformed throwaway materials such as Styrofoam into sculptural pieces that barely betray their humble origins. His interventions are usually subtle. Panchal prefers to reveal what he sees as the essence or potential of the raw material he uses. The process of creating a work is more akin to an excavation than actual sculpting. For his Mumbai show, Panchal collected commonplace items: pieces of granite (the kind used as worktops in kitchens), paper, khadi (homespun cotton), tree bark, recycled plastic and marble (often seen as flooring in affluent Indian homes). They’re all connected to the frenzy of construction that has been a feature of Mumbai in the last decade in its attempt to look like a modern world city. Panchal’s sculptures and installations abstrusely question the cogency of this city-wide project; he explores the idea of what is natural, and the artifice and effort that goes into making something seem so. Prai and pelom 2 (The Surface 2) reveal the processes that were applied to make them look the way they do. Both are slabs of granite that have been painted over by the granite sellers who supply construction and interior decoration firms. In prai, the original grey colour is evident in the lower part of the sculpture. It looks dully lifeless under the rich, warm artificial colour of the piece that sits on top. Pelom 2 is a gleaming, artificial green on top but the base of the sculpture fades to white. Here, the circular stains left by the piece of cloth that was used to apply the paint, as well as faint, green fingerprints of the labourer who worked on the slab are visible. Process was also emphasized in cicami: Panchal rubbed chalk over some parts of the marble to show the grooves left on the stone by the machine that cut it. The work of the artisan was the focus of qotred (whiter). A rectangular piece of pale, weathered-orange khadi that is commonly worn by labourers – like the one responsible for the colour of pelom 1 and quotred was hung so that its soft, wrinkling folds highlighted the fall and weave of the material. 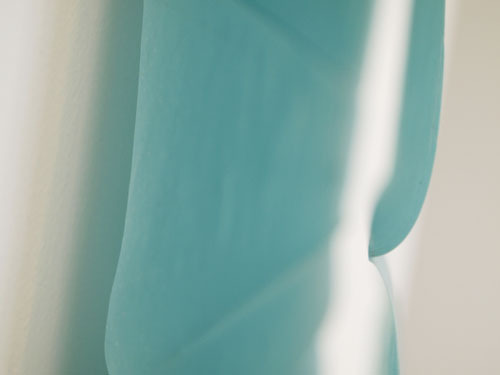 The colour contrasted sharply with the pallour of wedhneumi, a sculptural installation comprising the curling bark of a palm tree and crumpled handmade paper. 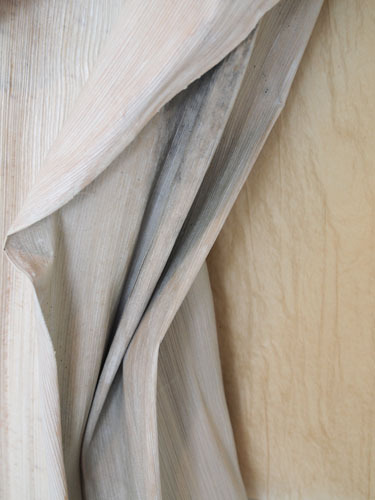 The panel of creased paper and the bark were installed to mimic the angle of a wilting body. Panchal treated the de-husked bark – which he had smuggled out of the compounds of Sir JJ School of Art, alma mater to some of India’s finest artists – with thinned white paint, which made it look like ageing skin; an illusion that was heightened by the dark patches on its grooved surface, which recalled age spots. The work that encapsulated all of Panchal’s concerns was cicami. It comprised four pieces of marble – three long panels and one squatter piece. The first three were installed so that they ran like a strip from wall to floor. The fourth rested against another wall, some distance away. Following the path suggested by the gallery’s layout, cicami initially looked like a disjointed arrangement of marble slabs. However, if you faced the four pieces and moved away from the work, the logic of the placement was revealed. The three panels created a frame for the fourth piece of unvarnished marble, giving it pride of place and drawing attention to its texture and the delicate palette of greys and white. It also looked like a partially-built skyscraper, with its jagged edges and natural surface emphasizing how much work would be needed to fashion it into glossy smoothness. There was, of course, a conceit at play in Panchal’s show. While the artist would have us believe that he was revealing the essence of the material he used, it was also evident that items that seem mundane to the average Mumbaikar – such as painted granite – were exotic to the Paris-based sculptor. After a Panchal makeover, quotidian granite, bark and khadi became silent, mysterious monoliths, crafted by the artist’s imagination. I’ve written about Shilpa Gupta’s new show, Someone Else, in my Sunday Guardian column. You can read it here. I love the dramatic headline: “Metallic library, books ablaze — Gupta shows art needs to be free”. I enjoyed almost every work in Someone Else. Some made for decent pictures as well.